Bheint Offerings - Jai Maa Chintpurni Ji! Jai Maa Chhinnmastika Ji! What could one offer to the one who Herself is the Giver, who Herself is the creator of all that exists in the world. However, offering smallest of items but with great love and respect shall appease the Mother Goddess, Mata Chintpurni Ji. No object is big or small, it is the affection attached to it that matters. Even if we go empty handed, but with great devotion, She would still be there for us to fill our hands with all the treasures we seek. Devotees would usually collect all itmes to offer, to revered Maa Chintpurni, or for any deity they pray to, in a plate (thali or tokri) and is called Bheint in Her honour. All devotees take various items as per thier devotion. From a petal of a flower to enormous garlands, from a piece of fruit to grandest of meals, whatever is offered to Her with sincere devotion, is acceptable to Her. 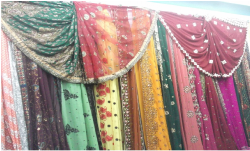 All items are usually available at the bheint/prasad shops near the temple. Else, one may choose to bring one's own choice of offerings to the temple. The traditional offerings to Mata Chintpurni Ji include all or any the following (not in any particular order). Click on any of the items on the left to see the details about them. Flowers are offered to Maa Durga in the form of garlands to ornate Her or as handful of petals or whole flowers or even bouquets, all as per the devotees choice. 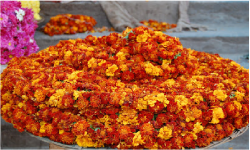 Devotees may even choose artificial flower garlands to offer as well. The beauty, the colour, softness, fragrance of flowers is bound to please anyone, even Gods. With the offerings of flowers we pray that as She has given us these beautiful, colorful flowers in so much abundance, may our hearts be full of abundant love for Her. Lighting of a diya represents the connection of one's soul to the Supreme Lord. As the diya emits light when the cotton wick burns, dipped in ghee or oil, in the same way, we get lifted towards enlightenment when the wicks of our souls burn out the oils of anger, hatred, lust, greed etc. The shining flame removes darkness by illuminating the path of wisdom. The flame is considered another form of Maa Durga, the fire element of the Universe, without which the world would not survive. Maa Durga manifests in the form of flames at Jwalamukhi Devi Temple situated about 35km North-East of Chintpurni Devi temple. Light is the remedy for darkness, hence, we all should become givers of light. Offering of light to the deities in any form, we become endued with beauty, energy, and resplendence. 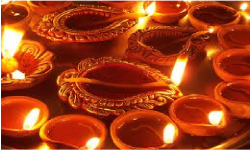 Lighted diyas are used while performing Aarti. 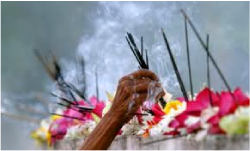 Lighting of the incense sticks as offerings, signfy our complete submission to the Lord. Dhoops and incenses are made of inflammable substances, in such a way that they may burn slowly or smoulder silently. They are the inseparable accompaniments of a worship of the deities. As the stick burns and spreads fragrance all around, may we also burn out our vices and spread the Lord's love and purity. Bangles are a dear ornament for almost every Indian women. Glass bangles, especially in Red, are said to be very dear to Maa Durga. 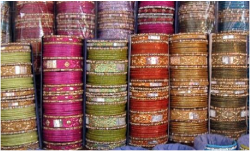 Devotees may offer bangles in various other colors or materials as well. During the Navratri puja, bangles are also offered to small girls, who are considered to be Maa Durga's souls. This is a sweet preparation made using Suji (Semolina), Ghee, Sugar and optionally, dry friuts. The Halwa is the Prasad being offered to Maa. After offering some of the quantity to Maa, the rest is returned by the priest to the devotee. Ingredients: 1 Cup Suji (Semolina/Rawa), 1/2 Cup ghee, 1 Cup water, 1/2 Cup sugar (adjust as per taste), Optionally, Some coarsely chopped almonds and cashews ans few raisins. Method: •Heat a pan on a medium heat and when hot add the ghee. When ghee melts, add the Sooji and mix well. •Roast the Sooji till it begins to turn light golden color and give off a light aroma. Remember to stirring frequently. •When the Sooji is roasted, carefully add the water, safely as it might splutter. Add sugar. Cook the mixture till it is thick and begins to come away from the sides of the pan. 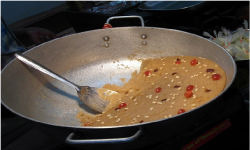 Now add the almonds, cashews and raisins (if you are adding them) to the Sooji and mix well. •Turn off the heat and allow the mixture to cool to a little. Chattar is an umbrella shaped ornament made of metal, and hung above the idol or photo frame of Maa. This is offered in honour of Maa. Usually the miniature forms of chattars are available for all. 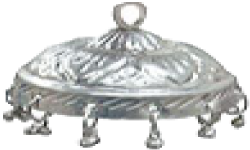 Devotees may buy bigger or more ornate chattars made of silver or even gold. 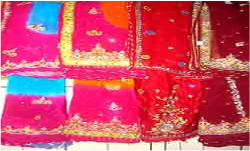 Also called, Chunni or Odhni, Chunri is the most dear attire for Maa, especially in red colour and decorated in golden. 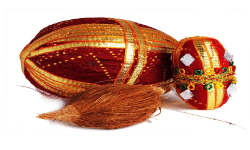 Chunris are available for purchase at bheint shops or devotees may choose to make one with their own hands. Red and golden threads, mirrors, beads, sequins etc are used to decorate the chunri. 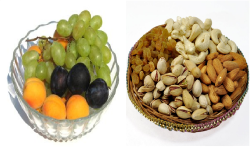 Fresh friuts, available as per the season, or dry fruits (chashews, almonds, walnuts, raisins etc) could be offered. Devotees may also choose to offer dresses or sarees to Maa. These can be used to ornate Maa Durga's idols in the temple. Coconuts are commonly used in most of the Hindu rituals. Devotess may carry a red flag called Dhwaja to offer in honour of Maa Chintpurni Ji. 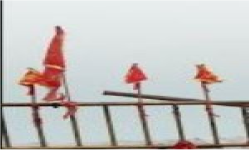 These are red colored flags, usually triangular and decorated in golden, fixed on a wooden or metal stick. Images of Durga Maa are depicted on them along with praises for Her like 'Jai Mata Di'. Other depictions on them could be symbol like 'Trishul', 'Om' - ॐ, Sun, Swatika, or Lotus also these could be any of the dieties like Lord Ganesha or Lord Hanuman. Flags can be seen hoisting on the apex of most of the Hindu temples. The depictions on the flags relate to the diety to who the temple is dedicated. Flags symbolise the highest regard, the red colour and golden decorations derive the glow and power as that of the sun. Shringar includes makeup items like, nail paint, lip color, kajal, bindi, kumkum, hair comb etc also including a mirror. Bangles could be part of the shringar or taken separately.